Rudolph Peters, 61, died yesterday afternoon at his home on Cass Street in Crete after a long illness. Funeral services will be held at 1:30p.m. 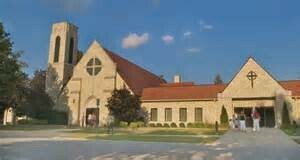 tomorrow from the Hack Chapel, Beecher, to the Trinity Lutheran Church, Crete. The Rev. A.T. Kretzmann will conduct the rites, and burial will be at the Beecher Mausoleum. 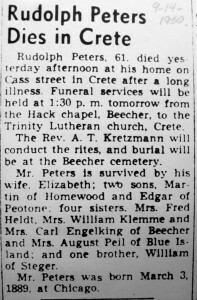 Mr. Peters is survived by his wife, Elizabeth; two sons, Martin of Homewood and Edgar of Peotone; four sisters, Mrs. Fred Heldt, Mrs. William Klemme and Mrs. Carl Engelking of Beecher and Mrs. August Piel of Blue Island; and one brother, William of Steger. 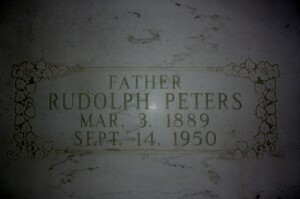 Mr. Peters was born March 3, 1889, at Chicago. Rudolph Peters, 61, brother of Mrs. Fred Heldt, passed away at his home in Crete, last Thursday afternoon, after an extended illness. Funeral services were conducted, Saturday, at 1:30 p.m. at the Hack Funeral Chapel and following at the Trinity Lutheran Church, Crete, Rev. A.T. Kretzmann officiating. Interment was in the Beecher cemetery. 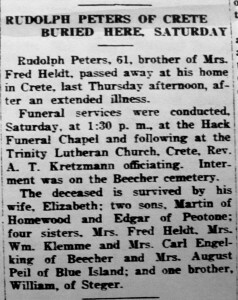 The deceased is survived by his wife, Elizabeth; two sons, Martin of Homewood and Edgar of Peotone; four sisters, Mrs. Fred Heldt, Mrs. Wm. Klemme and Mrs. Carl Engelking of Beecher and Mrs. August Piel of Blue Island; and one brother, William, of Steger. Other, more distant family include: Bahlman, Batterman, Bergmeier, Beseke, Bielfeldt, Bohl, Cloidt, Dunlap, Engleking, Fenske, Fick, Fiene, Freerking, Frobose, Graham, Guritz, Hack, Hager, Haltenhof , Heine, Heldt, Hildeman, Hinze, Hoffman, Hoppensteadt, Horn, Hunte, Kaczynski, Kappe, Kilborn, Kirchhoff, Klocksieben, Koch, Langreder, Leder, Maass, Matthias, Mc Carty, Meyer, Monk, Niedert, Ohlendorf, Pansa, Pralle, Riley, Ristenpart, Rohe, Rust, Saller, Selk, Struve, Thielman, Vagt, Von Engeln, Wegert, Wehmhoefer, Wiechen, Westphal, Wilkening. This entry was posted in Automated Burial Listing, Burial Listing, Burial Location, HEADSTONE, Obituary very limited, Trinity Lutheran - Crete by Sandra. Bookmark the permalink.